Summer ends and the majority of the flowers fade. Now is the time to collect seedpods, grasses with plumes and leaves. Cut branches and remove the lower leaves. To preserve, stand them in a jar containing two-three inches of glycerin and water, mixed two parts water and one part glycerin, or in straight antifreeze. Place them in a light, cool room away from animals and children. When the leaves change color and are pliable with a slight oily feel, they are done. Check every day. Over-done stems mildew easily. 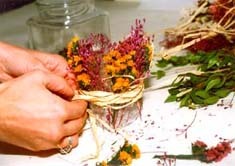 Lay the branches in a box to dry the stem end. To store the branches, either stand them in a container in a dry area or place them in a newspaper-lined box. Branches can be refreshed using steam or wiped with soapy water and then rinsed and dried well. They may be painted or pressed using a cool iron. Use Sahara (dry foam) for dry arranging. Spray fuzzy seed heads with hair spray or fixative to prevent shedding. A few spots of bright color like red or orange help dried arrangements. Use flower tubes and put in some bright carnations or gerberas. If fruit or vegetables are to remain long on the altar, brush shellac on them to halt any deterioration. Bananas should not be used for more than one day. Do not use real grapes. (They fall off the stem.) If the product is to be used one day and can be cooked afterward, use bamboo skewers to put them into the foam. If you use Oasis, always use standard or advantage. It takes a little longer to soak, but it does not crumble as fast. It should stick about two inches above the rim of the vase. Oasis is shaped like a brick with wide sides and narrow ends. When placed in the vase have the wider dimension along the sides. (The narrow edge will be facing you.) This allows full use of the sides of the brick. Placing greens and flowers so that they drop below the rim of the vase makes a pleasing look. If using a small-necked vase, you might put a small green designer bowl from your florist on top of the vase. It can be stuck down with sticky clay but the weight will hold it. A round plywood platform painted dark green with a dowel that goes down into the vase might also be used. Many of these church vases are very old and must be treated with respect, but we should use them. It’s a wonderful ministry to give your congregation.